Nova is a soft synthetic fiber, perfect for fine detail in oil painting. And unlike natural fiber, it can withstand the effects of acrylic paints and cleaning agents when oil media techniques are used in acrylic painting. Unique Nova brushes have small ridges that run along the filaments. By slowing down the flow of liquid from the brush, they enable the brush to retain color or medium for longer time periods. 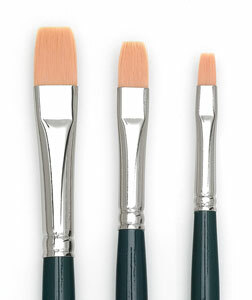 Brushes have nickel-plated, seamless brass ferrules.